Time sure does fly by real fast when you're having fun. And it is time for this months SRC reveal. This month I was Secrets from the Cookie Princess. Such a pretty name and such a pretty blog. I've spent hours going through The Cookie Princess' a.k.a Colleen's blog. I've had my eye on this blog for a while. Colleen has a huge collection of cookie posts. When I say huge, I mean HUGE. Saying "I was spoiled for choice" would be an understatement. I had such a hard time narrowing it down to one recipe for reveal day. In addition to her cookies, she has some other yummies too. I can wait to try this Pita Bread, her Roasted Garlic Flatbread and these Mini Fritttatas. However, since her blog is called Secrets from the Cookie Princess I knew from the start that I was going to try out a cookie recipe to being with. Also, its been ages since I made cookies at home. One glance at the Recipe Archive and I knew I was in trouble. I have a whole list of cookies and bars that I want to try out. Coming back to today's post, I decided to try out Colleen's Cinnamon Bars. I'm not too sure if they're supposed to be softer like a blondie or crisper like a cookie. Mine ended up more on the crisper side like a cookie. Don't get me wrong, I'm not complaining, just curious. Either way, the kitchen smelled wonderful while these were baking. These bars tasted wonderful. We absolutely loved them. The original recipe calls for pecans and I wanted to use almonds, but ended up using walnuts. I can't wait to see what these will be like with almonds. I know I'll be making these every now and then. Maybe the next time I'll try baking them for a slightly shorter while and see what they turn out like. Maybe I'll add some chocolate chips or even drizzle them with melted chocolate. The possibilities seem endless. All I know is that I've found a good base recipe and I intend keeping it. Thank you Colleen. Grease a 9" x 13" pan and keep aside. Cream the butter and sugar in a large bowl till light and fluffy. Add the egg yolk and the cinnamon powder and mix well, scraping down the sides of the bowl. Sift the flour and add it to the bowl 1 cup at a time and mix until combined. You should end up with a crumbly dough. Press the dough evenly into the greased pan. Pour the egg white over it and spread it around making sure it has coated the entire surface. Drain off any excess. Sprinkle the chopped walnuts over this base and lightly press into the dough. Let it cool in the pan itself. When cool, cut into bars. Oh I'm so glad you liked these (and how funny you had me since I was matched to you last month!). These are great bars that I haven't made in a while...maybe I should make them soon. As for the texture, I remember them being like a firm cookie--not overly chewy but not crispy either. Thanks for the kind words! Will keep that in mind Colleen ... thanks, once again! 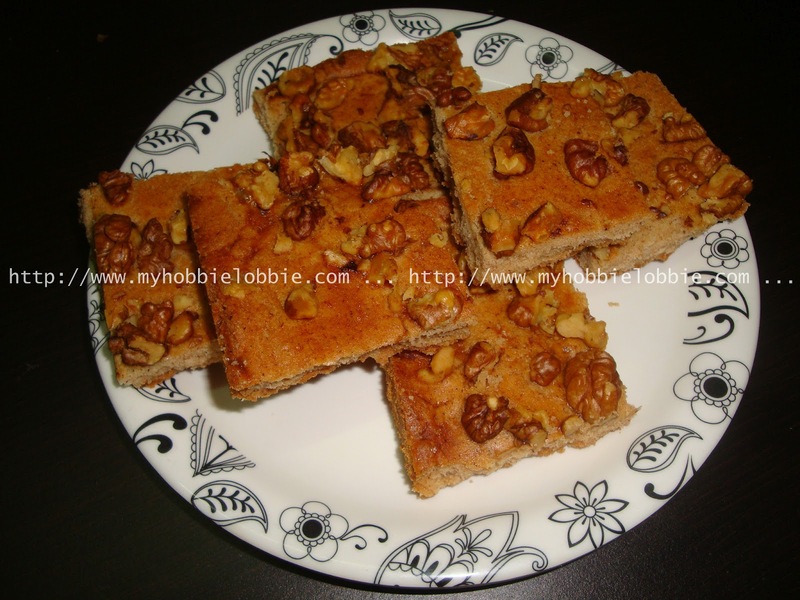 The bars look very tasty, and the recipe looks very straightforward. Not bad! The end result is great too! Thanks for stopping by! Your Nutty Cinnamon Bars look delicious, sure wish I had one right now. Great selection for SRC! These look fantastic and I can't wait to try them too! Thanks for sharing a terrific recipe! Its a pleasure Jane! I hope u like it as much as we did! I can imagine your home smelling wonderful as these cookies baked, I love cinnamon.